The aim of the protocol is to present an optimized procedure for the establishment of an in vitro blood-brain barrier (BBB) model based on primary porcine brain endothelial cells (pBECs). The model shows high reproducibility, high tightness, and is suitable for studies of transport and intracellular trafficking in drug discovery. Nielsen, S. S., Siupka, P., Georgian, A., Preston, J. E., Tóth, A. E., Yusof, S. R., Abbott, N. J., Nielsen, M. S. Improved Method for the Establishment of an In Vitro Blood-Brain Barrier Model Based on Porcine Brain Endothelial Cells. J. Vis. Exp. (127), e56277, doi:10.3791/56277 (2017). The aim of this protocol presents an optimized procedure for the purification and cultivation of pBECs and to establish in vitro blood-brain barrier (BBB) models based on pBECs in mono-culture (MC), MC with astrocyte-conditioned medium (ACM), and non-contact co-culture (NCC) with astrocytes of porcine or rat origin. pBECs were isolated and cultured from fragments of capillaries from the brain cortices of domestic pigs 5-6 months old. These fragments were purified by careful removal of meninges, isolation and homogenization of grey matter, filtration, enzymatic digestion, and centrifugation. To further eliminate contaminating cells, the capillary fragments were cultured with puromycin-containing medium. When 60-95% confluent, pBECs growing from the capillary fragments were passaged to permeable membrane filter inserts and established in the models. To increase barrier tightness and BBB characteristic phenotype of pBECs, the cells were treated with the following differentiation factors: membrane permeant 8-CPT-cAMP (here abbreviated cAMP), hydrocortisone, and a phosphodiesterase inhibitor, RO-20-1724 (RO). The procedure was carried out over a period of 9-11 days, and when establishing the NCC model, the astrocytes were cultured 2-8 weeks in advance. Adherence to the described procedures in the protocol has allowed the establishment of endothelial layers with highly restricted paracellular permeability, with the NCC model showing an average transendothelial electrical resistance (TEER) of 1249 ± 80 Ω cm2, and paracellular permeability (Papp) for Lucifer Yellow of 0.90 10-6 ± 0.13 10-6 cm sec-1 (mean ± SEM, n=55). Further evaluation of this pBEC phenotype showed good expression of the tight junctional proteins claudin 5, ZO-1, occludin and adherens junction protein p120 catenin. The model presented can be used for a range of studies of the BBB in health and disease and, with the highly restrictive paracellular permeability, this model is suitable for studies of transport and intracellular trafficking. At the interface of the circulatory and central nervous system (CNS), the BBB acts as a key regulatory site for homoeostatic control of the CNS microenvironment, which is essential for proper function and protection of the nervous system. The site of the BBB is the endothelial cells lining the blood vessel lumen. In brain capillaries, endothelial cells form complex intercellular tight junctions and strongly polarized expression patterns of particular influx and efflux transporters ensure highly specific molecular transport between the blood and the brain 1. The structural components of the tight junction complexes include proteins from the occludin and claudin family, zonula occludens (ZO) proteins, cingulin, and associated junctional adhesion molecules (JAMs). Claudin 5 is particularly important in the paracellular junctional restriction. Induction and maintenance of this characteristic BBB endothelial phenotype involve dynamic interactions with surrounding cells, including pericytes, astrocytes, neurons and the basement membranes, which together with brain endothelial cells form the neurovascular unit (NVU)2,3. The mechanisms involved in these interactions are not yet fully understood, but include exchange of chemical signals between cells, which allows modulation of BBB permeability in the short term and induces long-term BBB features4. Astrocytes especially are known to contribute to the brain endothelial cell phenotype and are a source of regulatory factors such as glial-derived neurotrophic factor (affecting intracellular cAMP)5, basic fibroblast growth factor6, hydrocortisone7, and transforming growth factor β (TGF-β)8. The effect of TGF-β, however, has been debated9. In vivo studies continue to provide valuable information on BBB biology. However, cell culture models can provide additional insights and constitute useful tools for understanding detailed molecular and functional aspects of the BBB in both health and disease. Although the complex interactions between the cell types and constituents of the BBB are difficult to fully achieve in in vitro models, there has been, since the first purification of brain endothelial cells and application of these in mono-cultures10,11,12, extensive development of the purification procedures and growth conditions of the BBB cell culture models, resulting in greater resemblance to the in vivo barrier. The commonly used in vitro BBB models are based on primary cells of rodent, porcine, and bovine origin, and on immortalized cell lines. Each model has different advantages and drawbacks. For comparison and model choice, validation markers such as expression of BBB enzymes, transporters, receptors, and structural proteins are used to create overviews of the current established models1. One important feature of the BBB is barrier tightness and high TEER, yet a large number of the available models do not reflect well the in vivo levels. Incorporating development and optimization contributions from several laboratories, the aim of this protocol is to present a method for establishing a high TEER in vitro BBB model based on primary pBECs in MC with or without ACM, or in NCC with primary astrocytes of rat or porcine origin. The applied procedures and establishment of the model include efforts to eliminate contaminating cells and to improve differentiation of pBECs into a BBB phenotype. This work has resulted in the establishment of reliable, high TEER models with low paracellular permeability and good functional expression of key tight junctional proteins, transporters, and receptors. However, as the astrocytes are a contributing factor to the brain endothelial cell phenotype, the three different conditions of culture represent three different phenotypes of brain endothelial cells. The NCC model is specifically useful for studies of certain specialized mechanisms involved in drug discovery, transport studies and intracellular trafficking, as well as for investigation of cell-cell interactions where maximal expression of BBB features is advantageous. The pBEC model described here is largely based on the porcine model developed at Eisai Laboratories (London) by Dr. Louise Morgan and colleagues, whichis based on a successful earlier bovine brain endothelial cell model13. The original method of cell preparation was a two-stage filtration using nylon meshes to catch the microvessels, followed by a subculturing step to improve purity. In the earlier development of the method, optimal BBB phenotype and barrier tightness were achieved by growth in supplemented medium, including ACM. Further modifications to the method were made by R. Skinner in Prof N. Rothwell's lab in Manchester UK14,15. The method was adopted by the Abbott laboratory, KCL London, where Patabendige made it significantly simpler to prepare by avoiding the use of astrocytes or ACM and by eliminating contaminating cells such as pericytes with puromycin. The first papers confirmed that the MC model preserved several important features of the in vivo BBB, including effective tight junctions, membrane transport systems and receptor-mediated transcytosis16,17,18,19,20. Later S. Yusof again tested astrocyte co-culture and found it significantly improved TEER, so this is the preferred variant currently used in the Abbott lab21. The model has now been successfully transferred to the M. Nielsen lab in Aarhus, where further modifications have been introduced (this protocol), including simplifying grey matter extraction, using only one mesh filtration step, and a single filter coating step combining collagen and fibronectin. The applied procedure for isolation of porcine astrocytes (this protocol) was based on protocols developed by the T. Moos laboratory in Aalborg, described by Thomsen et al22. The TEER and other properties of the model generated in London and Aarhus are similar, which lends confidence to the notion that the model is readily transferred between labs and responds well to careful observation and rationalization of method steps. Indeed, S. Yusof has now established the MC model in a tropical country (Malaysia)23, which involved further adjustment for local conditions and tissue sources. Compared to brain endothelial cells of bovine and rodent origin, pBECs provide the advantage of having a lower rate of loss of the in vivo BBB phenotype following isolation24. Furthermore, pBECs are capable of forming relatively tight endothelial barriers, even when grown in MC (800 Ω cm2)16 as compared to the commonly reported levels for monolayers of cell lines such as bEND.5 and bEND.3 (50 Ω cm2)25,26,27, cEND (300-800 Ω cm2)28,29,30, and cerebEND (500 Ω cm2)29,31,32, and primary brain endothelial cells of mouse (100-300 Ω cm2)33,34,35,36 and rat (100-300 Ω cm2)37,38. However, the TEER has shown dependency on the purification and culture procedures. In most cases, the addition of ACM or co-culture with astrocytes shows differentiating effects on the endothelial cells and an increase in tightness of the endothelial layers1. Nevertheless, with efforts to optimize the culturing conditions, only the bovine-based models have shown TEER values comparable to the porcine-based models (averages of 800 Ω cm2 in MC, up to 2500 Ω cm2 in astrocyte co-culture)13,39,40,41,42,43,44,45. As the models based on primary bovine brain endothelial cells have shown large variations, both between and within laboratories14,45,46,47,48, reproducibility could be an issue. In the pBEC model reported here, the contributing laboratories have achieved very similar TEER and paracellular permeability values with low variability, both in and between laboratories. Hence, it should be possible for other laboratories to establish a robust model with low variability using the method presented here. In addition to forming tight endothelial layers, models with pBECs have previously been validated by expression of tight junction proteins, functional BBB transporters, receptors and enzymes, and demonstrated suitability for a range of studies15,16,17,19,20,22,49,50,51,52,53,54,55,56,57,58,59. Furthermore, unpublished transcriptome data on the co-cultures of pBECs shows an expected profile of BBB transporters and receptors (unpublished results, Nielsen et al.). The porcine-based BBB model has a further advantage as the genome, anatomy, physiology, and disease progression of the pig reflect the human biology to a higher degree than other established models60, which are favorable features for the pharmaceutical industry. As porcine brains are a common by-product of the meat industry, they constitute an easily accessible source of brain endothelial cells, minimizing the number of animals needed for the experiments, and providing a high purification yield from one porcine brain. Although purification and cultivation of primary cells is somewhat time-consuming and requires expertise for standardization in setting up the model, primary cells generate the most reliable BBB models. Immortalized cell lines cannot be a substitute, as important properties such as barrier tightness, transporter expression profiles, and microenvironment regulation do not reflect the experimental findings in vivo61,62. In vitro models provide the advantage of live-cell imaging with higher resolution, making visualization of intracellular processes possible by allowing a close proximity approach to the sampled or observed cells, using objectives with higher magnification and better optical quality63. This is not the case for the use of two-photon microscopy in living animals. Furthermore, in vitro models provide the ability to transfect cells, allowing visualization of tagged proteins and investigation of their trafficking. The function of the BBB is not fixed and can be dynamically modulated in both physiology and pathology. In many neurological diseases, including neurodegenerative, inflammatory and infectious diseases, disruption and increased permeability of the BBB is observed64,65,66,67. In order to reduce and prevent disease progression and subsequent damage, identification and characterization of the molecular mechanisms underlying the modulation of the BBB are of major importance. In this context, reliable in vitro models are in high demand by the pharmaceutical industry, and furthermore play important roles in predicting BBB permeability of drugs to the CNS. Any in vitro model serving as a permeability screen should display a restrictive paracellular pathway, a physiologically realistic cell architecture and functional expression of transporter mechanisms68. Demonstrated in previous studies16,17,57, and by paracellular permeability and expression of TJ and AJ proteins here, the presented model meets all these criteria and is suitable for a range of BBB studies in both normal physiology and in pathology. The strengths of the presented purification and cultivation method include a combination of simplicity and reproducibility and the ability to include astrocytic influence with a resulting robust and reliable high TEER in vitro BBB model. For this purpose, astrocytes of porcine and rat origin have been shown to augment the BBB phenotype of pBECs in a similar way22. Porcine brains were obtained as byproducts of the Danish food industry. Danish Slaughterhouses are under strict supervision and observation by the Danish Ministry of Environment and Food. Rats used for isolation of astrocytes were bred and group-housed in the local animal facility at an ambient temperature of 22 °C-23 °C and on a 12/12 h dark/light cycle under inspection of the veterinarian and according to Danish regulations for lab animals. The rats were euthanized before they were sacrificed in accordance with international guidelines on the ethical use of animals (European Communities Council Directive of 24 November 1986; 86/609/EEC) and Danish guidelines. No in vivo experiments on animals or human material were used in these experiments. NOTE: Following is a pBEC main protocol describing (Step 1) purification, (Step 2) cultivation and (Step 3) TEER measurements. For setup of a NCC with astrocytes, an alternate protcol (Step 4) describing purification and cultivation of rat and porcine astrocytes is presented. Collect 8-10 brains from 5-6-month-old domestic pigs (e.g. from a nearby slaughterhouse) and transport them on ice to the laboratory. We recommend starting the following purification procedure within 2-3 h of termination of the animal. Place the brains in a sterile flow bench and gently wash them with 1 L PBS in a beaker placed on ice. Carefully remove meninges from one brain at a time using fine-tip forceps and transfer the meninges-free brains to another 1 L beaker with PBS placed on ice. Extending the time taken can complicate the removal. The approximate time used for each brain should be 10-15 min. Using a scalpel, scrape off grey matter from one brain at a time and transfer the isolated material to Petri dishes (8.8 cm2) containing 20 mL DMEM Nutrient Mixture F-12 (DMEM/F-12) placed on ice. Isolate as much grey matter as possible without withdrawing white matter material. For initial fragmentation, run the grey matter material through a 50-mL syringe without a needle. Continue for all the brains and pool the collected grey matter material. Extending the time taken can complicate the removal. The approximate time used for each brain should be 10-15 min. Transfer the isolated grey matter material to the grinder tube of a hand-held tissue homogenizer in a ratio of 50/50 with DMEM/F-12 media. Homogenize the material by making 8 up and down strokes with a loose pestle, followed by 8 up and down strokes with a tight pestle. Continue until all isolated material has been homogenized, then transfer the homogenate to a 500-mL bottle and dilute with DMEM/F-12 to approximately 450 mL total volume. Filter the homogenate using a 500-mL blue-cap bottle with filter holder and 140 µm filter-mesh, and isolate capillaries by running the tissue through the filter. Use one filter per 50 mL of homogenate and wash each filter with DMEM/F-12 afterwards. Place the capillary-containing filters in Petri dishes with a digestion solution of trypsin/EDTA (2.5 % trypsin, 0.1 nM EDTA in PBS), collagenase CLS2 (2,000 U/mL) and DNase 1 (3,400 U/mL) in DMEM/F-12. Use 1 Petri dish (8.8 cm2, 20 mL solution) per 3 filter meshes. Place the Petri dishes at 37 °C for 1 h on an orbital shaker at 180 rpm or stir them gently every 10 min. After 1 h, wash off the capillaries from the filters with suspension from the Petri dish using a 1 mL pipette. Split the suspension from the 3 dishes into 2 50-mL tubes and stop the digestion by adding 10 mL DMEM/F-12 to each 50-mL tube. Centrifuge the cell-suspensions at 250 x g, 4 °C for 5 min. Aspirate the supernatants and re-suspend each pellet in 10 mL of DMEM/F-12. Add a further 20 mL of DMEM/F12 to each tube. Repeat this centrifuge step twice. Let the tubes cool down on ice for 5 min and transfer the solutions to 2 new 50 mL tubes. Centrifuge the cell-suspensions at 250 x g, 4 °C for 5 minutes, and re-suspend each pellet in 8 - 10 mL (approximately 1 mL/brain used) of freezing solution consisting of 10% DMSO in FBS. Transfer the cell suspension to cryovials, using 1 mL per cryovial. On average, a purification results in 1 vial per brain used, on average providing endothelial cells for 12-16 inserts. Place the vials in a freezing box at -80 °C for at least 4 h up to overnight. Afterwards, store the cryovials in a cryotank with liquid nitrogen. Caution: Liquid nitrogen has extremely low temperatures. Please wear appropriate protection. To optimize the conditions for attachment of pBECs, perform coating of a T75 flask by adding a solution with final concentrations of collagen IV (150 µg/mL) and fibronectin (50 µg/mL) in ddH2O to the flask, making sure that the solution covers the whole surface. Use 10 mL for each T75 flask. Incubate at 37 °C for 2 h.
NOTE: The coating can be performed just before use or up to a week before and stored with PBS at 4 °C. The coating must not dry out, or it will no longer form a suitable attachment and growth surface. Prepare 16 mL of pBEC growth medium consisting of DMEM/F-12 supplemented with 10% plasma-derived serum (PDS), penicillin (100 U/mL), streptomycin (100 µg/mL), and heparin (15 U/mL). Supplement the medium with puromycin (4 µg/mL) to select for endothelial cells. Be aware that the puromycin treatment can only be used for a maximum of 5 days. Aliquot the prepared medium into 6 mL and 10 mL volumes in two 15 mL tubes. Bring a vial with capillaries from liquid nitrogen (Step 1.13), and thaw the capillaries by use of a 37 °C water bath or by adding 750 µL of the prepared medium from the 6-mL aliquot. If thawing by adding medium, carefully pipette up and down to thaw and homogenize the suspension. When thawed, transfer the cell suspension to the 6-mL medium aliquot. To remove freezing medium, spin the capillaries down at 250 x g, 4 °C for 7 min. Carefully aspirate the supernatant and re-suspend the pellet in 1-2 mL of the 10-mL aliquot. When re-suspended, transfer the solution to the 10-mL medium aliquot. Transfer the capillary suspension to the coated T75 flask and gently tilt the flask to ensure equal distribution over the surface. Place the T75 flask at 37 °C, 5% CO2. After overnight incubation, prepare 10 mL pBEC growth medium supplemented with puromycin (4 µg/mL) for one T75 flask and perform a medium change. Be aware that all medium solutions applied to cells should be pre-warmed to 37 °C before use. NOTE: Alternatively, a medium change can be performed 4-6 h post-plating when capillaries should have attached to the surface. Incubate the cells until 60-95% confluence is achieved, usually 3-5 days from thawing. Do not allow cells to reach 100% confluence to avoid contact-inhibition that can halt further cell growth. When the desired confluency is achieved, passage the endothelial cells to permeable membrane inserts (see section 2.2). If the desired confluency is not achieved on day 4, change of medium is performed. At the latest on day 6, cells should be passaged on to the permeable membrane inserts. If the required confluency is not achieved by day 6, the cells are not suitable for experimental use. NOTE:Preparation of astrocytes for NCC: When setting up the co-culture model, 2 - 8 week-old astrocytes in culture (see section 4) should be prepared for the co-culture model by performing a medium change on the day before passaging the endothelial cells to inserts. For each astrocyte well, prepare 1500 µL of astrocyte growth medium consisting of DMEM low glucose supplemented with 10% FBS, penicillin (100 U/mL) and streptomycin (100 µg/mL) and then perform the medium change. Prepare permeable membrane inserts (12-well plate with inserts of 1.12 cm2 surface area, 0.4 µm pores) for seeding of pBEC by coating with collagen IV (500 µg/mL) and fibronectin (100 µg/mL) in ddH2O. Use approximately 300 µL for each insert, and make sure that the solution covers the entire growing surface. Incubate at 37 °C, 5% CO2 for a minimum of 2 h.
Prepare 30 mL of pBEC growth medium (for media composition, refer to section 2.1.2) without puromycin. Aspirate medium from pBEC culture in the T75 flask and gently wash two times with 5 mL sterile PBS at room temperature. Trypsinize the cells by adding 2 mL of Trypsin-EDTA solution (2.5 % trypsin, 0.1 nM EDTA in PBS) to the T75, and place the flask at 37 °C, 5% CO2 for 5-7 min. To detach the brain endothelial cells, gently tap the side of the T75 flask with fingertips, eventually leaving surviving and stronger-attaching pericytes on the surface of the flask. Visually investigate detachment under a microscope. When 80% detachment is observed, stop trypsinization by adding 5 mL of medium. Transfer the cell solution to a 15 mL tube using a 10 mL pipette and spin down the brain endothelial cells by centrifugation at 250 x g, 4 °C for 7 minutes. Count the number of cells manually by use of a cell counting chamber or an automatic cell counting system. Prepare a cell solution of 2.2 x 105 cells/mL medium, resulting in a final seeding density of 1.1 x 105 cells/insert. Remove coating solution from the permeable membrane inserts and transfer 500 µL of the cell suspension to each insert. On one of the inserts, add only medium and use this insert as a 'filter only' control for the TEER measurements. For MC: Add 1500 µL of pBEC growth medium/ACM per well of the 12-well plate underneath the permeable membrane inserts. Place the permeable membrane inserts at 37 °C, 5% CO2 and incubate for 2 days. For NCC: Transfer inserts to wells with astrocytes refreshed with astrocyte growth medium the day before. Place the permeable membrane inserts at 37 °C, 5% CO2 and incubate for 2 days. NOTE: Be aware of the use of different media types in the bottom wells of the three models. On day 2, change the media on the permeable membrane inserts with pBECs. Prepare 500 µL of pBEC growth medium per insert, and carefully perform the change to minimize disruption of the cell layer. Incubate the cells for two days. Be aware that the media change is performed on inserts only, and not on bottom wells. For MC: For each insert and well, prepare 500 µL of pBEC growth medium containing cAMP (250 µM), hydrocortisone (550 nM) and RO (17.5 µM). MC: Prepare additionally 1500 µL of pBEC growth medium containing cAMP (250 µM), hydrocortisone (550 nM) and RO (17.5 µM). MC with ACM: Thaw 1500 µL of ACM and supplement it with cAMP (250 µM), hydrocortisone (550 nM) and RO (17.5 µM). For NCC: For each insert, prepare 500 µL of pBEC growth medium containing cAMP (250 µM), hydrocortisone (550 nM) and RO (17.5 µM). For each astrocyte well, prepare 1500 µL of DMEM/F-12 supplemented with penicillin (100 U/mL) and streptomycin (100 µg/mL), heparin (15 U/mL), cAMP (250 µM), hydrocortisone (550 nM) and RO (17.5 µM). For MC: Carefully aspirate medium from wells and inserts and add the differentiation medium to both compartments, using 500 µL for each insert and 1500 µL for each well. Be aware that disruption on either side of the insert can affect and disrupt the cell layer. For NCC: Carefully aspirate medium from wells and add 750 µL differentiation medium per well. Carefully aspirate medium from inserts and add 500 µL differentiation medium per insert. Then add the remaining 750 µL differentiation medium to each astrocyte well. For all models: Place the cells at 37 °C, 5% CO2 and incubate with differentiation medium until the next day. NOTE: Be aware that for the NCC with astrocytes, astrocytes are from this point kept in serum-free medium. On the day after stimulating cells with differentiation medium, prepare the tissue resistance measurement chamber system for TEER measurements by rinsing the chamber two times with ddH2O, one time with 70% EtOH for 5 min and 2 more times with ddH2O. Add 4 mL of DMEM/F-12 to the tissue resistance measurement chamber, connect it to the system and calibrate for approximately 30 min as per the following settings: R = 0, Test R = 1000, Mode = R.
Perform the TEER measurements by carefully placing the inserts in the Tissue resistance measurement chamber. For each insert, perform measurements in triplicate and calculate the average Ω cm2. NOTE: For the co-culture model, TEER values are expected to reach >500 Ω cm2. If the appropriate TEER level is not reached on the first day of measuring TEER, add new differentiation factors (cAMP (250 µM), hydrocortisone (550 nM) and RO (17.5 µM)) and measure TEER again on the following day. When appropriate levels are achieved, the model should be ready for the planned experiment. Be aware that the cells should rest for at least 3 h before performing the experiment to recover after TEER measurements. After stimulation, TEER values in general remain acceptable for 24-48 h after stimulation. NOTE: An alternative and quicker method using the rigid STX-100C electrode pair also records high TEER in this model81. The flexible STX2 electrode pair gives less reliable readings. For each rat brain used, coat 2 T75 flasks by adding 10 mL of poly-L-lysine (5 µg/mL) in ddH2O to each T75 flask. Incubate the flasks at 37 °C for 30 min. Decapitate 2 1 - 2 day old rats using an approved method. Cut the skin off the skull starting from the neck towards the nose, and cut the bone with a sagittal incision. Open the skull with curved forceps, take out the brain and place it in a 15 mL tube (tube 1) with 11 mL of DMEM low glucose supplemented with 10% FBS and gentamycin sulfate (125 µg/mL). Carefully remove meninges using fine-tip forceps and suspend the brain material using a 1 mL pipette. Obtain 1 brain from a 5-6-month-old domestic pig. Carefully remove meninges from the brain using fine-tip forceps and/or hands. Collect 4 g of grey matter from the brain and place the pieces in 1-2 mL DMEM low glucose supplemented with 10% FBS and gentamycin sulfate (125 µg/mL) in a Petri dish. If the pieces are large, mince with scalpels or forceps. Suspend the isolated material using a 1 mL pipette, move it to a 15-mL tube (tube 1) and fill with DMEM low glucose supplemented with 10% FBS and gentamycin sulfate (125 µg/mL) to a total volume of 11 mL. Continue homogenizing the isolated material with a long needle attached to a 10-mL syringe and suspend up and down 3 times. Wait until the big pieces have settled in the bottom of the tube, then collect 7 mL medium from the top of the tube (tube 1). Filter the 7-mL cell suspension through a 40 µm nylon filter into a new 50-mL tube (tube 2). Add 7 mL medium to tube 1 with the brain. Continue the homogenization and filtration from steps 4.1.2.2.5-6 until the volume of filtered cell suspension in tube 2 is approximately 35 mL. Remove the coating solution from the T75 flasks [step 4.1.1]. A quick washing with 5 mL PBS after incubation with poly-L-lysine can be used to ensure that the cells are not harmed by any toxic effects of the coating solution. Divide and seed the isolated astrocyte solution equally between the T75 flasks. Incubate the flasks at 37 °C, 5% CO2 for 3-5 days. After 3 - 5 days of incubation, perform a medium change by carefully aspirating medium and adding 10 mL of DMEM low glucose supplemented with 10% FBS and gentamycin sulfate (125 µg/mL). NOTE: After the first medium change, medium should be changed every 5 days. During the first 2 weeks, shake the flasks and wash the cells thoroughly with PBS when changing the medium. This aids in the removal of contaminating microglia. After 3 weeks of cultivation, trypsinize the cells by adding 2 mL of Trypsin-EDTA solution to the bottom of each T75 flask, and incubate them at 37 °C, 5% CO2 for 5-7 min. Stop trypsinization by adding 5 mL of medium, transfer the cell solution to a 15 mL tube and centrifuge the astrocytes at 250 x g, 4 °C for 7 min. Carefully remove the supernatant and re-suspend the cells in freezing solution consisting of 10 % DMSO in FBS. Count the number of cells and prepare a cell solution of 4.0 x 106 cells/mL. Freeze the cells in cryovials adding 1 mL per vial. Prepare 12-well plates for growth of astrocytes by adding 1 mL of poly-L-lysine (5 µg/mL) in ddH2O to each well. Place the plates at 37 °C for 2 h.
For each 12-well plate, prepare 25 mL of astrocyte growth medium (DMEM low glucose supplemented with 10% FBS and penicillin (100 U/mL) and streptomycin (100 µg/mL)). Bring the vial of astrocytes from liquid nitrogen and thaw the cells by adding 750 µL DMEM low glucose medium. Carefully pipette up and down to thaw and homogenize the suspension. When thawed, transfer the cell-suspension to a 15-mL tube and add medium to a total volume of 7 mL. Caution: Liquid nitrogen is extremely low temperature, so wear personal protection such as gloves. Carefully aspirate the supernatant and re-suspend the cells in medium. Remove the coating from the wells of the 12 well plates and transfer the cell suspension to wells using 1 mL per well. Incubate the cells at 37 °C, 5% CO2. Refresh the medium every third day and culture the cells for a minimum of 2 weeks before using the cells for co-culture with endothelial cells. The cells can be used for co-culture for up to 12 weeks after thawing, with the optimal age being 2-8 weeks. 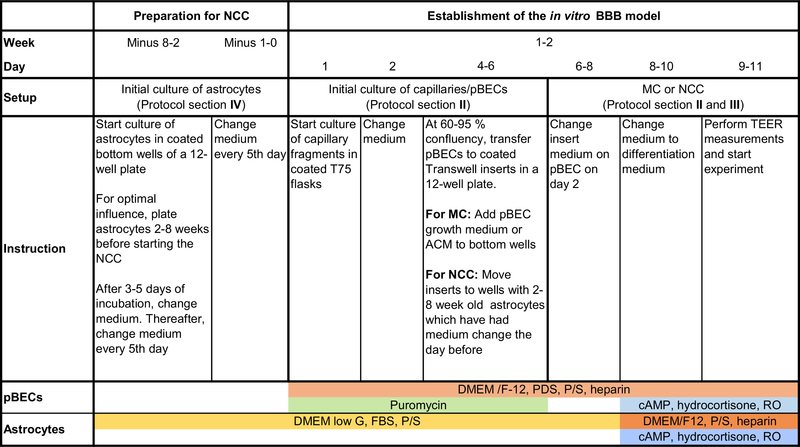 In the presented, optimized method, cultivation of pBECs and the establishment of the permeable membrane insert system with MC or without ACM or NCC with astrocytes (Figure 1) was carried out for a period of 9-11 days (Figure 2). For selection of endothelial cells, an initial culture of purified capillary fragments was combined with puromycin treatment for a maximum of 5 days, which eliminated most contaminating cells and promoted the growth of spindle-shaped endothelial cells from the capillary fragments (Figure 3A-C). At day 4-6, pBECs had proliferated to a confluency of 60-95%, growing as non-overlapping, contact-inhibited, longitudinally aligned cells. When the cells had reached the desired confluency, pBECs were plated on collagen IV and fibronectin coated permeable membrane insert filter membranes (1.12 cm2 surface area, 0.4 µm pores) at a density of 1.1 x 105 cells/insert, at which they normally formed confluent monolayers after 4 days (day 8-10 post isolation). When co-culturing pBECs, astrocytes of rat or porcine origin were plated on poly-L-lysine coated bottom wells for a minimum of 2 weeks before starting the NCC (Figure 3D). When establishing the NCC, experience has shown that astrocytes cultured for 2-8 weeks provide the best support for promoting the BBB phenotype in pBECs; within this time, the astrocytes formed confluent cultures with cells arranged in a honeycomb-like structure (Figure 3E-F). On day 4 in the permeable membrane insert system model (day 8-10 post isolation), cells were stimulated with cAMP, hydrocortisone and RO to increase the barrier tightness and BBB characteristic expression pattern of tight junctional proteins, transporters, and receptors. Visual cell inspection combined with TEER measurement are routinely the most reliable ways to assess the confluency and tightness of the endothelial cell layer growing on the permeable membrane inserts prior to experiments. Figure 4 shows results from two series of experiments to assess small molecule drug permeability through the BBB, the control parameters of TEER (reflecting ionic permeability) combined with apparent permeability21 (Papp, cm s-1) of either radiolabeled sucrose or the dye tracer Lucifer yellow (LY), reflecting paracellular permeability of typical small drug molecules (~200-600 Da). A compound of interest with a Papp greater than the Papp of sucrose or LY (depending on the molecular weight of the drug) could suggest transcellular permeability and/or transport across the cells. Figure 4 shows that in permeable membrane inserts with pBECs cultured above rat astrocytes, good batches of pBEC (e.g. here the LY set) will generate TEERs in the range ~500-2000 Ω cm2, with a few higher or lower. Some batches, especially during early stages of learning the protocol, may have lower TEERs around 100-900 Ω cm2 (e.g. here the sucrose set). TEER measurement allows selection of filters, for example with starting TEER >500 Ω cm2, and over the range of TEER shown, Papp is relatively independent of TEER, indicative of a sufficiently tight barrier layer for these experiments. The protocol for measuring permeability depends on the type of solute/construct. For a description of the procedure for measuring permeability of small molecules in NCC, a protocol is described in Yusof, SR, et. al21. 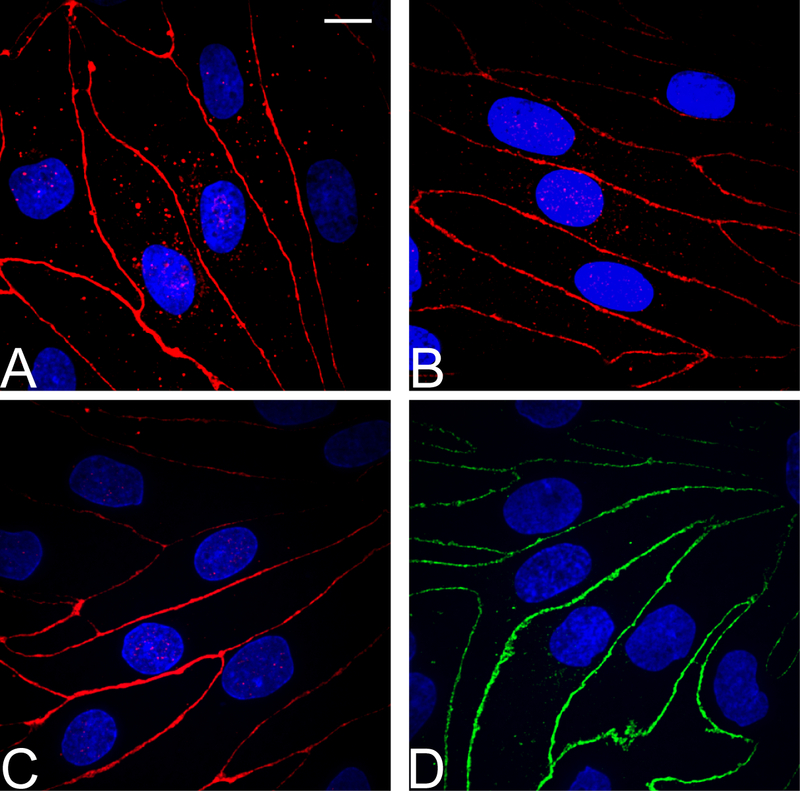 Evaluation of expression of the tight junction proteins in pBECs in NCC with rat astrocytes showed localization of claudin 5, occludin, and ZO-1 along the cell-cell junctions, as shown by immunofluorescence (Figure 5A-C). Also, the adherens junction protein p120 catenin showed well-defined distribution along the cell-cell junctions (Figure 5D). Figure 1: Schematic representation of the applied in vitro BBB models. Schematic representation of the permeable membrane insert system models of pBECs in MC (A), MC with ACM (B), and NCC with astrocytes (C). In the MC, either pBEC growth medium or ACM were applied in the bottom wells, whereas in the NCC, inserts with pBECs were placed in wells with 2-8-week-old astrocytes. Please click here to view a larger version of this figure. Figure 2: Flow chart of the main steps during pBEC cultivation and the establishment of the presented models. For an overview and timeline for the method, this schematic presentation summarizes the main steps in the culturing procedure of pBECs and establishment of the presented models, i.e. MC with or without ACM, and NCC with astrocytes. Please click here to view a larger version of this figure. Figure 3: Representative time course of initial cultures of pBECs and rat astrocytes. Phase contrast microscopy images of cultures of pBECs (A-C) and astrocytes (D-F) viewed over 5 days. Purified capillary fragments on the first day of the initial culture showed presence of both capillaries and contaminating cells (A, day 1), which after medium change on day 2 and an additional day of growth, showed selection for pBECs, starting their growth from the capillary fragments (B, day 3). Confluent monolayers of pBECs were usually achieved on day 4-6, at which time pBECs showed spindle-shaped morphology and were longitudinally aligned (C). Rat astrocytes seeded in bottom wells normally proliferated to confluent layers within 5 days (D-F), and were used for NCC models after 2 weeks of growth. Scale bar for all pictures: 200 µm. Please click here to view a larger version of this figure. Figure 4: Tight junction integrity of pBECs. 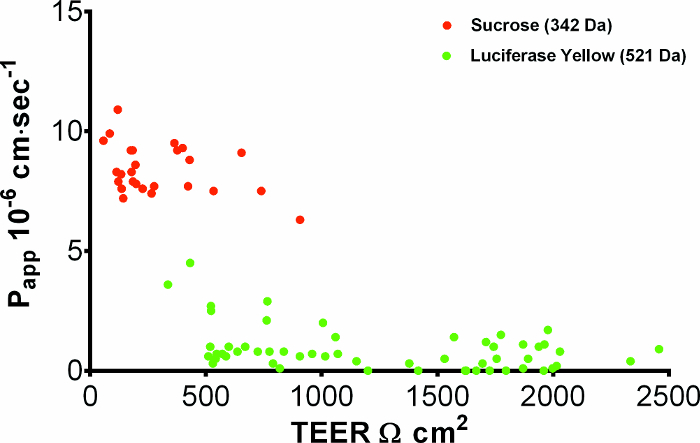 Apparent permeability (Papp) of pBECs to paracellular markers Sucrose (MW 342.5 14C-labelled, 14.8-25.9 GBq/mmol) and Lucifer Yellow (MW 521.57, 10 µg mL-1), plotted against TEER. pBECs were grown on 1.12 cm2 permeable membrane insert filters above rat astrocytes in the base of the well and markers added to the apical chamber. After 1 hour at 37 ˚C, appearance of marker in the basal chamber was measured and apical-to-basal Papp (x 10-6 cm sec-1) calculated. TEER was measured >3 h before Papp, using STX100C EVOM electrodes, corrected for the blank permeable membrane insert filter with resistance 150 Ω. Average TEER for the Lucifer Yellow data set was 1249 ± 80 Ω cm2 (mean ± SEM, n=55). Please click here to view a larger version of this figure. Figure 5: Immunocytochemical characterization of pBECs. For pBECs grown on 1.12 cm2 permeable membrane insert filter inserts above rat astrocytes in the base well, immunofluorescence microscopy analysis of the tight junction components (A) Claudin 5 (B) Occludin (C) ZO-1, and adherens junction protein (D) p120 catenin showed well-defined localization at cell-cell junctions and revealed confluent brain endothelial cell layers with spindle-shaped, non-overlapping cells. Scale bar for all pictures: 10 µm. Please click here to view a larger version of this figure. During the purification procedure, critical steps include rapid and effective removal of meninges and separation of white and grey matter, which is important for the purification yield and purity and for the proper establishment of the model. For the presented in vitro BBB model using pBECs, we have improved and simplified a purification procedure based on mechanical homogenization of isolated grey matter, size-selective filtering for isolation of microvessels, digestion with collagenase, DNase and trypsin, with an initial culture of microvessel fragments. In general, one of the major challenges during purification and cultivation of primary cells is the elimination of contaminating cells. Experience with purification of primary brain endothelial cells has indicated that thorough removal of both meninges and white matter results in improved purity and yield of capillaries, as well as increased endothelial cell growth and expression of BBB characteristics. For this reason, careful removal of meninges (including inside sulci) in the presented protocol was designed to ensure removal of leptomeningeal cells (which have fibroblast-like properties), as well as of arterial and arteriolar smooth muscle cells, which grow more rapidly than endothelial cells in culture. Likewise, minimization of the white matter material resulted in purer endothelial cell cultures, with fewer contaminating cells growing from the isolated capillary fragments. However, this simplified and quick method applied for isolation lowers the yield of isolated capillaries, and optimization of grey matter isolation could improve the yield of each brain significantly. A density gradient, which is included in an alternative purification protocol69, can be used for isolating free endothelial cells and improving endothelial cell purity, but it is time consuming and can likewise lower the yield. Both of these purification methods have been extensively used and characterized, and share the characteristics of generating high TEER pBEC models in both MC and astrocyte co-culture (normally 500-1500 Ω cm2)7,16,21,22,49,57,70,71. In order to establish monolayers with high paracellular restrictiveness, experience has shown that pericytes must be eliminated from the endothelial cultures16. Porcine brain pericytes generally grow below the pBEC layers and do not cause holes in the endothelial layers, as observed for cultures of rat brain endothelial cells72,73. Pericytes in pBEC cultures do, however, tend to affect the morphology of the endothelial cells, which appear broader and with irregular cell boarders16. Because brain endothelial cells express higher levels of efflux transporters (e.g. P-glycoprotein) than other cell types in the microvessels, the number of contaminating cells can be reduced by puromycin treatment74. Additionally, use of plasma-derived serum (PDS) rather than fetal or neonatal calf derived serum favors the growth of endothelial cells, as the PDS has a lower concentration of growth factors such as platelet-derived growth factor and vascular endothelial growth factor, which are shown to increase BBB permeability and stimulate angiogenesis14,75,76,77. By introducing an initial culture of isolated capillary fragments and combining this with puromycin treatment (4 µg/mL) and use of PDS, we succeeded in greatly reducing the number of contaminating cells remaining after the purification, so that thereafter we could establish tight endothelial monolayers on permeable membrane inserts. 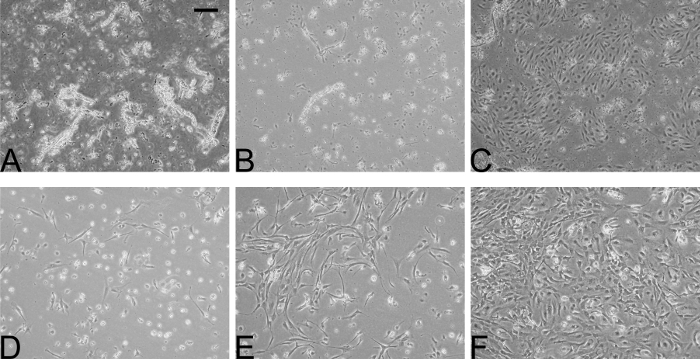 In order to ensure the best attachment of endothelial cells on both culture dishes and permeable membrane insert surfaces, it has been observed that a coating mixture of collagen type IV (from human placenta) and fibronectin greatly increases the proliferation yields, and the combined mixture was therefore favored over the traditional method using only collagen type I78. The pBECs in MC generally retain many BBB key features following isolation, so that co-culture with astrocytes is not essential for inducing functional tight junctions and achieving high TEER values16,57. Efforts to optimize the conditions for differentiation of the endothelial cells into BBB phenotype include use of serum-containing medium supplemented with 8-CPT-cAMP, hydrocortisone7 (increasing the intracellular cAMP level13) and RO 20-1724 (maintaining the intracellular cAMP level), which in accordance with previous findings74,79 together successfully improved the barrier tightness and increased TEER, and may also have helped to restore a more in vivo like gene expression profile80. However, the use of hydrocortisone for the tightening of the endothelial layer may modify the response of the endothelial cells to certain stimuli, and for the purpose of using the model for investigation of responses to chemo- and cytokines during inflammation, the use of hydrocortisone may need to be avoided. From comparative studies with MC, MC with ACM and astrocyte co-cultures in both the participating laboratories and elsewhere, it has been shown that astrocytic contribution is capable of improving endothelial BBB features and increasing the barrier tightness21,40,42,49,79,81,82,83. In order to achieve such high expression of BBB phenotype in pBECs, we established a NCC with astrocytes and found that both porcine and rat primary astrocytes were beneficial, as also observed in other laboratories22. During the establishment of the astrocyte NCCs, experience has shown that the purity and age of the astrocyte cultures influence the resulting endothelial barrier tightness, with the optimum age of the astrocytes being 2-8 weeks, which correlates with an observed change in the astrocyte morphology over time. On the day before establishing the NCC, a medium change for the astrocytes is intended to remove harmful metabolites and allow enough time for the astrocytes to release stimulation and signaling factors influencing the barrier development. When co-culturing the endothelial cells and astrocytes in the permeable membrane insert system, it is important to pay special attention to the handling of the barrier model. During medium change, both aspiration and addition of the medium and the movements of the inserts must be done carefully in order to minimize disruption of the endothelial barrier. A great challenge when using primary cells for establishing in vitro models is to achieve high reproducibility between cultures. Such standardization may be met by the choice of method, use of high quality tools and reagents, and experience in microdissection. The high reproducibility with low batch-to-batch variation for the presented method is therefore highly dependent on strict adherence to the described procedures. To achieve a good reproducibility between batches and vials during TEER measurements, a tissue resistance measurement chamber or epithelial voltmeters with rigid miniature electrodes, rather than flexible chopstick electrodes can be used, reducing the variability of observed TEER values. In addition to achieving high TEER values (Figure 4), the reliability of the presented model is confirmed by the corresponding low small solute permeability (Figure 4), and by the immunocytochemical characterization of the pBECs (Figure 5). The use of transgenic and miniature pigs has increased during the last decades, but the amount of in vivo data is still limited compared to data available for rodent models, and therefore may pose a challenge for comparing the in vitro porcine data with in vivo results. However, as the biology of the pig reflects human biology more closely than many established laboratory animals, and transgenic pig models for studying neurological diseases such as Alzheimer's disease have now been established84, the availability of in vivo data is expected to become less problematic with time. A limitation of the current permeable membrane insert system models of the BBB is the inability to mimic the blood flow in microvessels. In vivo, shear stress has been shown to affect many aspects of endothelial cell physiology such as division, differentiation, migration and apoptosis85,86, and to influence important BBB characteristics such as the expression of junctional proteins, and the induction and polarization of transporters61,85,87. To introduce such conditions, newly developed microfluidic systems can be considered88,89,90. A useful method to correct for the effect of the unstirred water layer (aqueous boundary layer) from in vitro permeability data is to derive the predicted 'intrinsic permeability' in vivo, using the software based approach21. This software can also be used for detailed permeability data analysis21. As the components of neurovascular unit have been shown to play important roles in inducing and maintaining BBB features, and no current in vitro model has yet been able to fully mimic the in vivo conditions, important constituents and interactions may still be missing. Current efforts in developing the presented model include establishing triple-culture models with both astrocytes and pericytes, and experiments combining cells of different species. Incorporation of pericytes has so far has not been observed to significantly increase the TEER levels of the barrier. However, syngeneic porcine models have been observed to be comparable to triple cultures using porcine brain endothelial cells, rat astrocytes, and rat pericytes with respect to barrier tightness and expression of hallmark proteins characteristic of the brain endothelium22. In order to develop a model based on human cells, future developments of in vitro BBB models for drug discovery and delivery may rely on the derivation of human pluripotent stem cells and adult stem and/or progenitor cells21. The authors would like to acknowledge Elisabeth Helena Bruun, Sarah Christine Christensen, and Niels M. Kristiansen for technical assistance, and the Lundbeck Foundation grant number R155-2013-14113. Helms, H. C., et al. In vitro models of the blood-brain barrier: An overview of commonly used brain endothelial cell culture models and guidelines for their use. Journal of Cerebral Blood Flow, Metabolism. 0, (0), 1-29 (2016). Abbott, N. J., Rönnbäck, L., Hansson, E. Astrocyte-endothelial interactions at the blood-brain barrier. Nature Rev Neurosci. 7, (1), 41-53 (2006). Hawkins, B. T., Davis, T. P. The blood-brain barrier/neurovascular unit in health and disease. Pharmacol Rev. 57, (2), 173-185 (2005). Abbott, N. J. Anatomy and Physiology of the Blood-Brain Barriers. Drug Delivery to the Brain SE - 1. 10, 3-21 (2014). Igarashi, Y., et al. Glial cell line-derived neurotrophic factor induces barrier function of endothelial cells forming the blood-brain barrier. Biochem Biophys Res Commun. 261, (1), 108-112 (1999). Sobue, K., et al. Induction of blood-brain barrier properties in immortalized bovine brain endothelial cells by astrocytic factors. Neurosci Res. 35, (2), 155-164 (1999). Hoheisel, D., et al. Hydrocortisone Reinforces the Blood-Brain Barrier Properties in a Serum Free Cell Culture System. Biochem Biophys Res Commun. 244, (1), 312-316 (1998). Tran, N. D., Correale, J., Schreiber, S. S., Fisher, M. Transforming growth factor-beta mediates astrocyte-specific regulation of brain endothelial anticoagulant factors. Stroke; a journal of cerebral circulation. 30, (8), 1671-1678 (1999). Takeshita, T., et al. Cilostazol attenuates ischemia-reperfusion-induced blood-brain barrier dysfunction enhanced by advanced glycation endproducts via transforming growth factor-β1 signaling. Mol cell neurosci. 60, 1-9 (2014). DeBault, L. E., Kahn, L. E., Frommes, S. P., Cancilla, P. A. Cerebral microvessels and derived cells in tissue culture: Isolation and preliminary characterization. In Vitro. 15, (7), 473-487 (1979). Bowman, P. D., et al. Primary Culture of Capillary Endothelium from Rat Brain. In Vitro IN VITRO Tissue Culture Association. 17, (4), 353-362 (1981). Bowman, P. D., Ennis, S. R., Rarey, K. E., Lorris Betz, A., Goldstein, G. W. Brain microvessel endothelial cells in tissue culture: A model for study of blood-brain barrier permeability. Annals of Neurology. 14, (4), 396-402 (1983). Rubin, L. L., et al. A cell culture model of the blood-brain barrier. The Journal of cell biology. 115, (6), 1725-1735 (1991). Wang, W., Dentler, W. L., Borchardt, R. T. VEGF increases BMEC monolayer permeability by affecting occludin expression and tight junction assembly. American journal of physiology. Heart and circulatory physiology. 280, (1), H434-H440 (2001). Cantrill, C. A., Skinner, R. A., Rothwell, N. J., Penny, J. I. An immortalised astrocyte cell line maintains the in vivo phenotype of a primary porcine in vitro blood-brain barrier model. Brain Research. 1479, 17-30 (2012). Patabendige, A., Skinner, R. A., Morgan, L., Joan Abbott, N. A detailed method for preparation of a functional and flexible blood-brain barrier model using porcine brain endothelial cells. Brain Research. 1521, 16-30 (2013). Patabendige, A., Skinner, R. A., Abbott, N. J. Establishment of a simplified in vitro porcine blood-brain barrier model with high transendothelial electrical resistance. Brain Research. 1521, 1-15 (2013). Patabendige, A., Abbott, N. J. Primary Porcine Brain Microvessel Endothelial Cell Isolation and Culture. Current Protocols in Neuroscience. 69, 3.27.1-3.27.17 (2014). Teow, H. M., Zhou, Z., Najlah, M., Yusof, S. R., Abbott, N. J., D'Emanuele, A. Delivery of paclitaxel across cellular barriers using a dendrimer-based nanocarrier. International Journal of Pharmaceutics. 441, (1-2), 701-711 (2013). Dickens, D., et al. A Multi-System Approach Assessing the Interaction of Anticonvulsants with P-gp. PLoS ONE. 8, (5), e64854 (2013). Yusof, S. R., Avdeef, A., Abbott, N. J. In vitro porcine blood-brain barrier model for permeability studies: pCEL-X software pKaFLUX method for aqueous boundary layer correction and detailed data analysis. European Journal of Pharmaceutical Sciences. 65, 98-111 (2014). Thomsen, L. B., Burkhart, A., Moos, T. A Triple Culture Model of the Blood-Brain Barrier Using Porcine Brain Endothelial cells, Astrocytes and Pericytes. PLOS ONE. 10, (8), e0134765 (2015). Liew, K. -F., Hanapi, N. A., Chan, K. -L., Yusof, S. R., Lee, C. -Y. Assessment of the Blood-Brain Barrier Permeability of Potential Neuroprotective Aurones in Parallel Artificial Membrane Permeability Assay and Porcine Brain Endothelial Cell Models. Journal of Pharmaceutical Sciences. 106, (2), 502-510 (2017). Deli, M. A., Abrahám, C. S., Kataoka, Y., Niwa, M. Permeability studies on in vitro blood-brain barrier models: physiology, pathology, and pharmacology. Cellular and molecular neurobiology. 25, (1), 59-127 (2005). Omidi, Y., Campbell, L., Barar, J., Connell, D., Akhtar, S., Gumbleton, M. Evaluation of the immortalised mouse brain capillary endothelial cell line, b.End3, as an in vitro blood-brain barrier model for drug uptake and transport studies. Brain Research. 990, (1), 95-112 (2003). Paolinelli, R., et al. Wnt Activation of Immortalized Brain Endothelial Cells as a Tool for Generating a Standardized Model of the Blood Brain Barrier In Vitro. PLoS ONE. 8, (8), e70233 (2013). Steiner, O., Coisne, C., Engelhardt, B., Lyck, R. Comparison of Immortalized bEnd5 and Primary Mouse Brain Microvascular Endothelial Cells as in vitro Blood-Brain Barrier Models for the Study of T Cell Extravasation. Journal of Cerebral Blood Flow, Metabolism. 31, (1), 315-327 (2011). Förster, C., et al. Occludin as direct target for glucocorticoid-induced improvement of blood-brain barrier properties in a murine in vitro system. The Journal of Physiology. 565, (2), 475-486 (2005). Silwedel, C., Förster, C. Differential susceptibility of cerebral and cerebellar murine brain microvascular endothelial cells to loss of barrier properties in response to inflammatory stimuli. Journal of Neuroimmunology. 179, (1-2), 37-45 (2006). Kleinschnitz, C., et al. Glucocorticoid Insensitivity at the Hypoxic Blood-Brain Barrier Can Be Reversed by Inhibition of the Proteasome. Stroke. 42, (4), 1081-1089 (2011). Neuhaus, W., et al. Addition of NMDA-receptor antagonist MK801 during oxygen/glucose deprivation moderately attenuates the upregulation of glucose uptake after subsequent reoxygenation in brain endothelial cells. Neuroscience letters. 506, (1), 44-49 (2012). Neuhaus, W., Gaiser, F., Mahringer, A., Franz, J., Riethmüller, C., Fӧrster, C. The pivotal role of astrocytes in an in vitro stroke model of the blood-brain barrier. Frontiers in Cellular Neuroscience. 8, 352 (2014). Stamatovic, S. M., Keep, R. F., Kunkel, S. L., Andjelkovic, A. V. Potential role of MCP-1 in endothelial cell tight junction 'opening': signaling via Rho and Rho kinase. Journal of Cell Science. 116, (22), 4615-4628 (2003). Weidenfeller, C., Schrot, S., Zozulya, A., Galla, H. -J. Murine brain capillary endothelial cells exhibit improved barrier properties under the influence of hydrocortisone. Brain Research. 1053, (1-2), 162-174 (2005). Deli, M. A., Abrahám, C. S., Niwa, M., Falus, A., et al. N,N-diethyl-2-[4-(phenylmethyl)phenoxy]ethanamine increases the permeability of primary mouse cerebral endothelial cell monolayers. Inflamm Res. 52, Suppl 1. S39-S40 (2003). Calabria, A. R., Weidenfeller, C., Jones, A. R., de Vries, H. E., Shusta, E. V. Puromycin-purified rat brain microvascular endothelial cell cultures exhibit improved barrier properties in response to glucocorticoid induction. Journal of Neurochemistry. 97, (4), 922-933 (2006). Molino, Y., Jabès, F., Lacassagne, E., Gaudin, N., Khrestchatisky, M. Setting-up an In Vitro Model of Rat Blood-brain Barrier (BBB): A Focus on BBB Impermeability and Receptor-mediated Transport. Journal of Visualized Experiments. (88), e51278 (2014). Rutten, M. J., Hoover, R. L., Karnovsky, M. J. Electrical resistance and macromolecular permeability of brain endothelial monolayer cultures. Brain research. 425, (2), 301-310 (1987). Cecchelli,, et al. In vitro model for evaluating drug transport across the blood-brain barrier. Advanced drug delivery reviews. 36, (2-3), 165-178 (1999). Dehouck, M. P., Méresse, S., Delorme, P., Fruchart, J. C., Cecchelli, R. An easier, reproducible, and mass-production method to study the blood-brain barrier in vitro. Journal of neurochemistry. 54, (5), 1798-1801 (1990). Gaillard, P. J., et al. Establishment and functional characterization of an in vitro model of the blood-brain barrier, comprising a co-culture of brain capillary endothelial cells and astrocytes. European journal of pharmaceutical sciences official journal of the European Federation for Pharmaceutical Sciences. 12, (3), 215-222 (2001). Helms, H. C., Waagepetersen, H. S., Nielsen, C. U., Brodin, B. Paracellular tightness and claudin-5 expression is increased in the BCEC/astrocyte blood-brain barrier model by increasing media buffer capacity during growth. The AAPS journal. 12, (4), 759-770 (2010). Helms, H. C., Madelung, R., Waagepetersen, H. S., Nielsen, C. U., Brodin, B. In vitro evidence for the brain glutamate efflux hypothesis: Brain endothelial cells cocultured with astrocytes display a polarized brain-to-blood transport of glutamate. Glia. 60, (6), 882-893 (2012). Garberg, P., et al. In vitro models for the blood-brain barrier. Toxicology in Vitro. 19, (3), 299-334 (2005). Helms, H. C., Hersom, M., Kuhlmann, L. B., Badolo, L., Nielsen, C. U., Brodin, B. An Electrically Tight In Vitro Blood–Brain Barrier Model Displays Net Brain-to-Blood Efflux of Substrates for the ABC Transporters, P-gp, Bcrp and Mrp-1. The AAPS Journal. 16, (5), 1046-1055 (2014). van der Sandt, I. C., et al. Assessment of active transport of HIV protease inhibitors in various cell lines and the in vitro blood--brain barrier. AIDS. 15, (4), London, England. 483-491 (2001). Schaddelee, M. P., et al. Functional role of adenosine receptor subtypes in the regulation of blood-brain barrier permeability: possible implications for the design of synthetic adenosine derivatives. European journal of pharmaceutical sciences official journal of the European Federation for Pharmaceutical Sciences. 19, (1), 13-22 (2003). Malina, K. C. -K., Cooper, I., Teichberg, V. I. 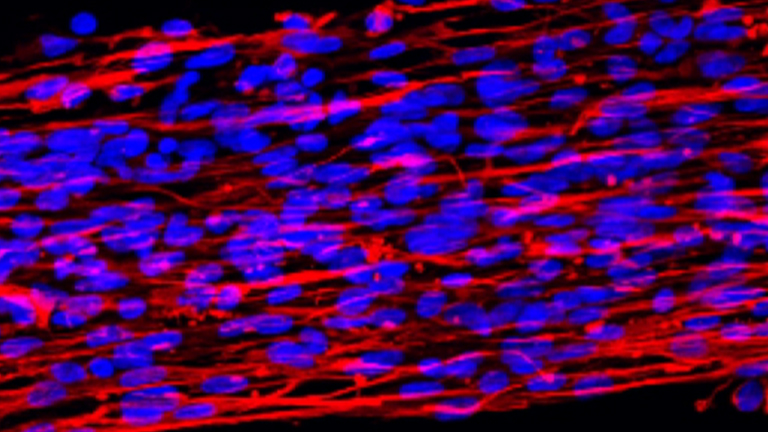 Closing the gap between the in-vivo and in-vitro blood-brain barrier tightness. Brain Research. 1284, 12-21 (2009). Franke, H., Galla, H. J., Beuckmann, C. T. An improved low-permeability in vitro-model of the blood-brain barrier: transport studies on retinoids, sucrose, haloperidol, caffeine and mannitol. Brain research. 818, (1), 65-71 (1999). Thanabalasundaram, G., Schneidewind, J., Pieper, C., Galla, H. -J. The impact of pericytes on the blood-brain barrier integrity depends critically on the pericyte differentiation stage. The International Journal of Biochemistry, Cell Biology. 43, (9), 1284-1293 (2011). Thanabalasundaram, G., El-Gindi, J., Lischper, M., Galla, H. -J. Methods to Assess Pericyte-Endothelial Cell Interactions in a Coculture Model. Methods Mol Biol. 686, 379-399 (2011). von Wedel-Parlow, M., Wölte, P., Galla, H. -J. Regulation of major efflux transporters under inflammatory conditions at the blood-brain barrier in vitro. Journal of Neurochemistry. 111, (1), 111-118 (2009). Zozulya, A., Weidenfeller, C., Galla, H. -J. Pericyte-endothelial cell interaction increases MMP-9 secretion at the blood-brain barrier in vitro. Brain Research. 1189, 1-11 (2008). Mahringer, A., Delzer, J., Fricker, G. A fluorescence-based in vitro assay for drug interactions with breast cancer resistance protein (BCRP, ABCG2). European Journal of Pharmaceutics and Biopharmaceutics. 72, (3), 605-613 (2009). Gutmann, H., Török, M., Fricker, G., Huwyler, J., Beglinger, C., Drewe, J. Modulation of Multidrug Resistance Protein Expression in Porcine Brain Capillary Endothelial Cells In Vitro. Drug Metabolism and Disposition. 27, (8), (1999). Skinner, R., Gibson, R., Rothwell, N., Pinteaux, E., Penny, J. Transport of interleukin-1 across cerebromicrovascular endothelial cells. British Journal of Pharmacology. 156, (7), 1115-1123 (2009). Van Gelder, W., Huijskes-Heins, M. I. E., Van Dijk, J. P., Cleton-Soeteman, M. I., Van Eijk, H. G. Quantification of Different Transferrin Receptor Pools in Primary Cultures of Porcine Blood-Brain Barrier Endothelial Cells. Journal of Neurochemistry. 64, (6), 2708-2715 (2002). Huwyler, J., Drewe, J., Klusemann, C., Fricker, G. Evidence for P-glycoprotein-modulated penetration of morphine-6-glucuronide into brain capillary endothelium. British journal of pharmacology. 118, (8), 1879-1885 (1996). Walters, E. M., Agca, Y., Ganjam, V., Evans, T. Animal models got you puzzled? : think pig. Annals of the New York Academy of Sciences. 1245, (1), 63-64 (2011). Shawahna, R., Decleves, X., Scherrmann, J. -M. Hurdles with using in vitro models to predict human blood-brain barrier drug permeability: a special focus on transporters and metabolizing enzymes. Current drug metabolism. 14, (1), 120-136 (2013). Weksler, B. B., et al. Blood-brain barrier-specific properties of a human adult brain endothelial cell line. FASEB journal official publication of the Federation of American Societies for Experimental Biology. 19, (13), 1872-1874 (2005). Siupka, P., et al. Bidirectional apical-basal traffic of the cation-independent mannose-6-phosphate receptor in brain endothelial cells. Journal of Cerebral Blood Flow, Metabolism. (2017). Xu, C. -Y., Zhu, H. -M., Wu, J. -H., Wen, H., Liu, C. -J. Increased permeability of blood-brain barrier is mediated by serine protease during Cryptococcus meningitis. Journal of International Medical Research. 42, (1), 85-92 (2014). Roberts, D. J., Goralski, K. B. A critical overview of the influence of inflammation and infection on P-glycoprotein expression and activity in the brain. Expert opinion on drug metabolism, toxicology. 4, (10), 1245-1264 (2008). Correale, J., Villa, A. The blood-brain-barrier in multiple sclerosis: functional roles and therapeutic targeting. Autoimmunity. 40, (2), 148-160 (2007). Desai, B. S., Monahan, A. J., Carvey, P. M., Hendey, B. Blood-brain barrier pathology in Alzheimer's and Parkinson's disease: implications for drug therapy. Cell transplantation. 16, (3), 285-299 (2007). Gumbleton, M., Audus, K. L. Progress and limitations in the use of in vitro cell cultures to serve as a permeability screen for the blood-brain barrier. Journal of Pharmaceutical Sciences. 90, (11), 1681-1698 (2001). Franke, H., Galla, H., Beuckmann, C. T. Primary cultures of brain microvessel endothelial cells: a valid and flexible model to study drug transport through the blood-brain barrier in vitro. Brain research. Brain research protocols. 5, (3), 248-256 (2000). Schulze, C., Smales, C., Rubin, L. L., Staddon, J. M. Lysophosphatidic acid increases tight junction permeability in cultured brain endothelial cells. Journal of neurochemistry. 68, (3), 991-1000 (1997). Cohen-Kashi-Malina, K., Cooper, I., Teichberg, V. I. Mechanisms of glutamate efflux at the blood-brain barrier: involvement of glial cells. Journal of cerebral blood flow and metabolism: official journal of the International Society of Cerebral Blood Flow and Metabolism. 32, (1), 177-189 (2012). Abbott, N. J., Hughes, C. C., Revest, P. A., Greenwood, J. Development and characterisation of a rat brain capillary endothelial culture: towards an in vitro blood-brain barrier. Journal of cell science. 23-37 (1992). Parkinson, F. E., Hacking, C. Pericyte abundance affects sucrose permeability in cultures of rat brain microvascular endothelial cells. Brain Research. 1049, (1), 8-14 (2005). Perrière, N., et al. Puromycin-based purification of rat brain capillary endothelial cell cultures. Effect on the expression of blood-brain barrier-specific properties. Journal of Neurochemistry. 93, (2), 279-289 (2005). Dobrogowska, D. H., Lossinsky, A. S., Tarnawski, M., Vorbrodt, A. W. Increased blood-brain barrier permeability and endothelial abnormalities induced by vascular endothelial growth factor. Journal of neurocytology. 27, (3), 163-173 (1998). Harhaj, N. S., Barber, A. J., Antonetti, D. A. Platelet-derived growth factor mediates tight junction redistribution and increases permeability in MDCK cells. Journal of Cellular Physiology. 193, (3), 349-364 (2002). Wang, W., Merrill, M. J., Borchardt, R. T. Vascular endothelial growth factor affects permeability of brain microvessel endothelial cells in vitro. The American journal of physiology. 271, (6 Pt 1), C1973-C1980 (1996). Tilling, T., Korte, D., Hoheisel, D., Galla, H. J. Basement membrane proteins influence brain capillary endothelial barrier function in vitro. Journal of neurochemistry. 71, (3), 1151-1157 (1998). Perrière, N., et al. A functional in vitro model of rat blood-brain barrier for molecular analysis of efflux transporters. Brain Research. 1150, 1-13 (2007). Calabria, A. R., Shusta, E. V. A genomic comparison of in vivo and in vitro brain microvascular endothelial cells. Journal of cerebral blood flow and metabolism: official journal of the International Society of Cerebral Blood Flow and Metabolism. 28, (1), 135-148 (2008). Abbott, N. J., Dolman, D. E. M., Drndarski, S., Fredriksson, S. M. An Improved In Vitro Blood-Brain Barrier Model: Rat Brain Endothelial Cells Co-cultured with Astrocytes. Methods in molecular biology. 814, Clifton, N.J. 415-430 (2012). Boveri, M., et al. Induction of blood-brain barrier properties in cultured brain capillary endothelial cells: comparison between primary glial cells and C6 cell line. Glia. 51, (3), 187-198 (2005). Culot, M., et al. An in vitro blood-brain barrier model for high throughput (HTS) toxicological screening. Toxicology in Vitro. 22, (3), 799-811 (2008). Aigner, B., et al. Transgenic pigs as models for translational biomedical research. Journal of Molecular Medicine. 88, (7), 653-664 (2010). Naik, P., Cucullo, L. In Vitro Blood-Brain Barrier Models: Current and Perspective Technologies. J Pharmaceutical Sciences. 101, (4), 1337-1354 (2012). Cucullo, L., Hossain, M., Puvenna, V., Marchi, N., Janigro, D. The role of shear stress in Blood-Brain Barrier endothelial physiology. BMC Neuroscience. 12, (1), 40 (2011). Neuhaus, W., Lauer, R., Oelzant, S., Fringeli, U. P., Ecker, G. F., Noe, C. R. A novel flow based hollow-fiber blood-brain barrier in vitro model with immortalised cell line PBMEC/C1-2. Journal of biotechnology. 125, (1), 127-141 (2006). Griep, L. M., et al. BBB ON CHIP: microfluidic platform to mechanically and biochemically modulate blood-brain barrier function. Biomedical Microdevices. 15, (1), 145-150 (2013). Prabhakarpandian, B., et al. SyM-BBB: a microfluidic blood brain barrier model. Lab on a Chip. 13, (6), 1093 (2013). Walter, F. R., et al. A versatile lab-on-a-chip tool for modeling biological barriers. Sensors and Actuators B: Chemical. 222, 1209-1219 (2016).